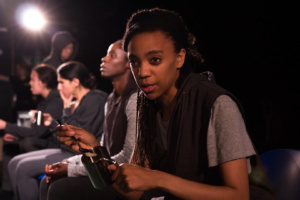 The Scar Test presented by Untold Arts and directed by Sara Joyce was a fantastically honest production reflecting how refugees are treated from individual female perspectives. 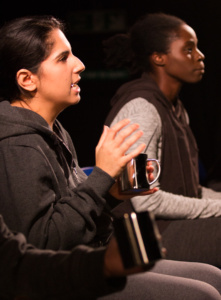 Written by Palestinian-Irish playwright Hannah Khalil the production was centred around verbatim interviews with women detained in the Yarlswood Immigration Removal Centre. The play explored the injustices and humiliation faced by refugees and portrayed an important message. The narrative consisted of snapshots of different stories and the frustrations faced by innocent women trapped in the system. The characters were personable, often incorporating humour to emphasise their relatability. Rebecca Omogbehin’s performance was distressing and powerful. She played a woman who fled her country after suffering unspeakable abuse whilst trying to maintain dignity and pride. She poignantly captured the sense of shame the woman felt by having to reveal her scars and waiting to find out whether the physical and emotional damage would be deemed sufficient evidence to grant her asylum in the UK. Shazia Nicholls displays seamless versatility in her portrayal of a wide array of characters, notably a frustrated and exhausted solicitor desperately trying to assist these struggling women who desperately need help and legal representation. The set was minimal with the presence of four ceiling mounted CCTV cameras, never allowing the audience to forget that the detainees were always being watched and gave it a prison like feel. The use of costume by Amelia Jane Hankin was also effective, with the whole cast in grey giving a sense of institutionalised uniformity and the lack of individual identity felt by the detainees. All the performers wore hoods that were put up when playing the role of security, the faceless, insensitive representation of the system. The production was a moving and harrowing insight into the emotional turmoil faced by female refugees. The performances were extremely emotionally charged and at times distressing but it was a sensitive, hard-hitting production that successfully communicated an urgent and important message that everyone should hear.